The British had their Hurricane and the US had the P-40. It was an aircraft that was on the brink of obsolescence, but was what the USAAC had when war started in late 1941. Despite it being heavier and less maneuverable than the aircraft it was up against, it did have a rugged construction, decent firepower, and could dive out of any battle it found itself involved in. Using the planes superior diving speed and good armament, the P-40 was able to hold its own against the best that the Japanese had, as long as the pilot used diving attacks and refused to get into dogfights. 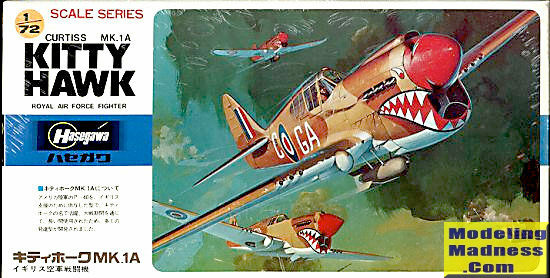 Thanks to its use with the RAF in North Africa, the P-40E variant was equipped with the sort of things that help pilots survive in combat; self sealing fuel tanks and armor plating. In fact, the P-40 excelled as a ground attack aircraft, despite having a liquid cooled engine and at low level was a fair combat aircraft. It was enough to keep the plane in production until near the end of the war and ensured its use with a number of Allied air forces. When Hasegawa started with the engraved panel line thing in the late 1970s or early 1980s, the P-40E was one of those aircraft in the initial offering. They provided a good shape, crisp detailing and an excellent starting place for additional detailing. 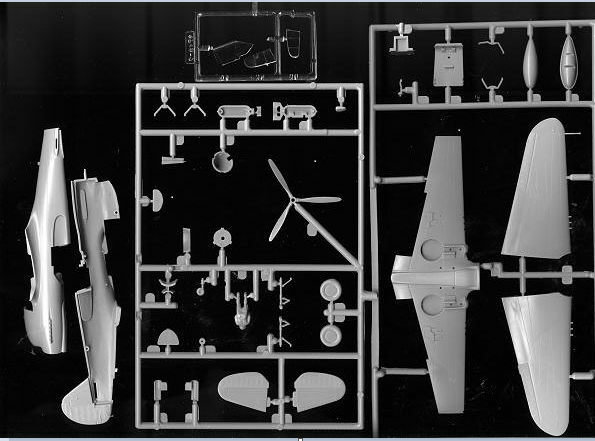 It also allowed Hasegawa to produce the two major variants (the P-40E and P-40N) using most of the same sprues. That in turn allowed a multiplicity of different boxings with little different from them aside from decals. This is one of those kits. Over the decades the molds have held up well. There is a tiny bit of flash, but not that much. Detailing is still very good with crisply engraved panel lines and a good fabric representation on the control surfaces. We still have a rather generic cockpit, with but a decal for the instrument panel, but there are oodles of aftermarket bits for this one, including a very nice and inexpensive cockpit set. The only things offered for options are the choice between a bomb and a drop tank for under the fuselage. There is also a blister for the gun camera, which you may want to not use. It is obvious that, despite all the Japanese on the box, that this one was destined for the US/UK as it included a second set of instructions, this one in English. At this time, Hasegawa was not connected with Gunze so all the color information is generic, but we all pretty well know what is what. Two markings options are provided. The box art plane in a desert scheme was with 112 Squadron in the North African desert. The other is a US plane in OD over Neutral Grey with the 49th FG. Decals may still be viable, but with a plethora of aftermarket sheets for this aircraft, that may well be the best option. Is this still the best P-40E in this scale? That is open to debate as a lot of companies have produced them. I'd say it is better than the Heller or old Revell, or the ancient Airfix kit. The Academy one may well be more detailed if their M/N kit is anything to gauge it by. I've not built the Hobby Boss version so it could also be a contender. One thing for sure, I've built a lot of these and they are pretty easy to find for not a lot of money, especially those in the Minicraft boxing.